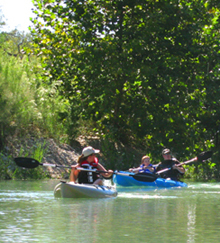 Come out to the beautiful Hill Country and experience 6 miles of the spring-fed South Llano River! From quiet pools to gentle riffles and runs, this river is an experience you don't want to miss. Note: January 2019 - Due to damage from recent floods, this trail is closed to all river users until further notice. Check back for updates. 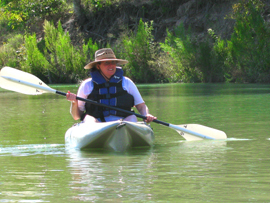 Put-in: South Llano State Park: The put-in for this paddling trail is located at the river crossing just inside the South Llano River State Park. To reach the park, travel Interstate 10 to Junction, then go south on US Highway 377 for 5 miles to Park Road 73. Take-out: Junction City Park: The take-out for this paddling trail is located in Junction's City Park on the north bank of Junction Lake just east of the bridge over the lake. To reach Junction's City Park, travel Interstate 10 to Junction. 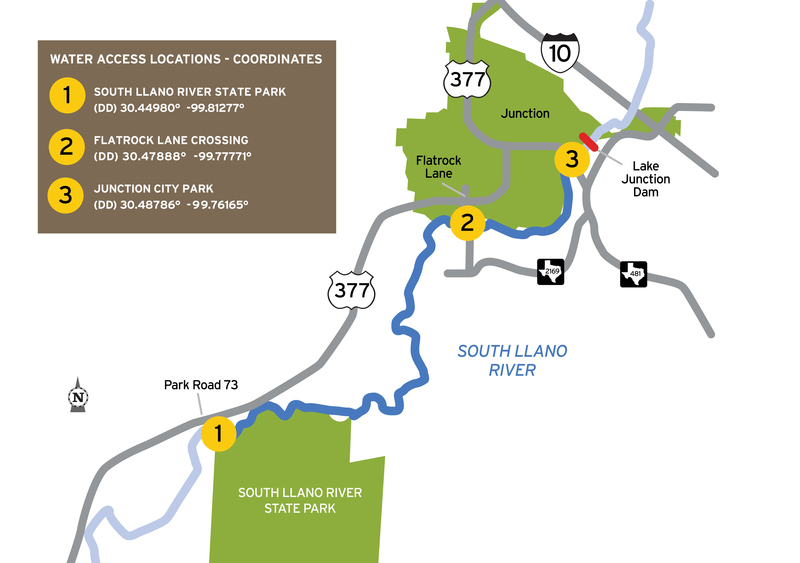 Follow Main St. or TX-481 Loop to the north side of Junction Lake bridge, also known as South Llano bridge. Alternate Access Site: Flatrock Lane Crossing: The alternate access, located at Flatrock Lane crossing, may be used for a take-out or as a put-in. To reach Flatrock Lane crossing, travel Interstate 10 to Junction, then go south on US Highway 377 approximately 1 mile from the red-light at intersection of Main St. and Hwy 377 to Flatrock Lane. Then take a left, crossing the river to the designated parking and access areas. Note: February 18, 2015 - The concrete "apron" on the downstream side of the bridge access site at South Llano River State Park has collapsed. This collapse has made the apron unsafe to walk or stand upon. Due to this recent damage, the apron on both the upstream and downstream side of the bridge has been CLOSED for your safety. Please do not proceed past the barriers at the bridge. Further, all kayaks, canoes, and tubes must exit the river at the designated location, prior to the bridge, and portage around the bridge before reentering the river on the downstream side of the bridge. This beautiful, spring-fed river contains a variety of water types, including quiet pools, riffles, and runs. 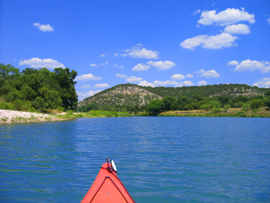 Be sure to take along fishing gear and binoculars as the South Llano River is home to abundant quantities of the state fish of Texas, the Guadalupe Bass, and offers tremendous birding opportunities as well. Although there are no man-made obstructions on this reach, there may be snags to avoid, especially when water levels are low. Heavy rains and high water can create dangerous conditions. 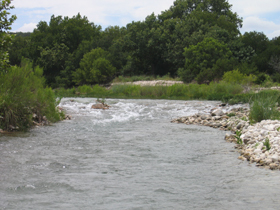 The clean, clear waters of the South Llano River are unrestrained by flood control dams or other man-made structures along this stretch of river. As such, the South Llano River is readily influenced by rainfall runoff that may create temporary high flows and undesirable water quality conditions. Flow information. This section of the river supports numerous Guadalupe and largemouth bass, several species of sunfish, and catfish. Small lures such as jigs, plastic worms, spinner baits, and light-line are recommended. The riparian corridor of the South Llano River supports a great diversity of plant and animal life along the river and beyond the banks. All three species of kingfishers (ringed, green, and belted) reside along the river; along with phoebes, egrets, herons, wood ducks, and a variety of migratory songbirds in the spring and early fall. The sycamore, pecan, elm, and oak trees growing along the river provide shelter and significant winter roost habitat for Rio Grande wild turkeys. Other common wildlife encountered include white-tailed deer, squirrel, rabbits, fox, beavers, bobcats, and armadillos. Exotic deer such as axis, black buck antelope, and fallow deer may also be spotted. Respect private property by not trespassing or littering and keeping noise levels down. This river is classified as navigable, which permits public use of the streambed and, if necessary, the banks to portage (go around) any hazard. However, when encountering an obstruction in the riverbed, one must take a direct path around and return to the streambed without lingering on the banks. Any other use of private river banks without permission of the landowner can be considered trespassing. Under Texas Penal Code (§30.05), criminal trespass occurs when one enters property after receiving notice not to enter. Notice includes verbal notice, a fence, sign(s), purple paint on posts or trees, or the visible presence of crops grown for human consumption. The Texas Tech University Center at Junction is home to the largest inland field station in the state of Texas, the Llano River Field Station whose main objective is to coordinate applied projects dealing with water/watersheds, exotic species, range management, natural resources, ecological restoration, and environmental education. This 411-acre facility offers collegiate summer academic sessions and a K-12 Exemplar Outdoor School Program and also serves as an ideal location to facilitate professional organizations for meetings and retreats. For additional information, please visit the website www.junction.ttu.edu. Kimble County Historical Museum, located at 101 North 4th Street in downtown Junction, contains artifacts, memorabilia, and photographs reflecting the unique history of the county and its people. Open weekday afternoons. Information available at 325/446-4219. This trail was made possible through a partnership between between the City of Junction, Kimble Co., Texas Tech University Center at Junction, South Llano Watershed Alliance, and Texas Parks and Wildlife Department. 1606 College St. Junction, TX 76849. (325)446-2905 or cell (830)459-7265. 409 Main St., Junction, TX 76849. (325)446-3588.